Yuna Software, the company that develops, designs and markets Messenger Plus!, today announced the addition of a new product to its portfolio: Messenger Plus! for Skype. Messenger Plus! 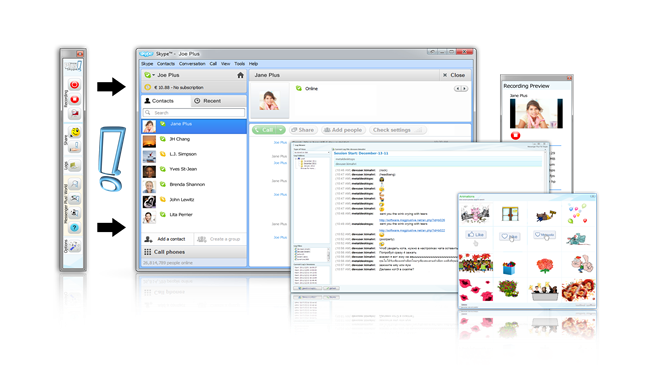 is the most popular and respected extension for Windows Live™ Messenger 2009 and 2011 and has more than ten years experience in the instant messaging arena. “We’re releasing the first version of this exciting product after a lot of hard team work“, says Jean-Francois Gregoire, CEO Kimahri Software. “You can now send more than 35 winks (flash video animation), record original Skype video and audio calls for free and easily access your Skype chat logs with the Messenger Plus! log viewer. All of this can be done through our slick, dockable, toolbar window“. Messenger Plus! has leveraged their expertise in chat logging – the ability to record, view, store, search and retrieve conversation history – to develop an advanced video and audio capture engine for recording Skype calls. • Record your video and audio call recording of unlimited duration. • See a live preview of the video call recording. • Send flash video animation (Winks) to your friends, family and co-workers. Choose from more than 35 available cool animations.